Summary (from Amazon): Parvana felt the shadow before she saw it, as the man moved between her and the sun. Turning her head, she saw the dark turban that was the uniform of the Taliban. A rifle was slung across his chest as casually as her father's shoulder bag had been slung across hers.... The Talib kept looking down at her. Then he put his hand inside his vest. keeping his eyes on Parvana, he drew something out of his vest pocket. Parvana was about to squish her eyes shut and wait to be shot when she saw that the Talib had taken out a letter. He sat down beside her on the blanket. "Read this," he said. Review: I really like the character Mrs. Weera because she was described so perfectly that I could picture her. She had good personality. Another character that I like is Parvana, not because she was the main character, but because she was a confident girl who would do what she had to so that her family would be healthy. Finally, I liked Parvana's father because he stayed calm in the most dificult situations and would keep everyone else calm. Also, he was very smart and had to have been brave because he needed to be with the Taliban, especially when the letters he was reading had bad news. He was risking getting hurt by a talib. I would want to meet Mrs. Weera in real life. That is only because it is always fun to meet a strong woman who isn't afraid to fight back. I would especially want to meet her when something bad was happening to me or my family because she would make everything feel better. 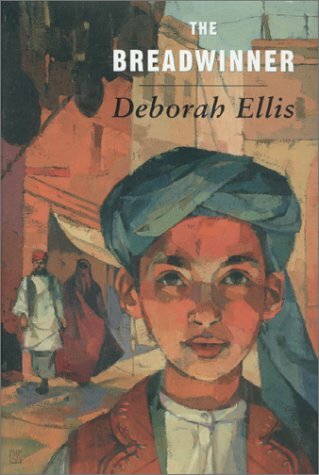 I liked that the story was set in Afghanistan because a lot of kids don't usually read cultural books. Also, the author helps you see the story happening as it happens. When I finished the book and saw the map of Afghanistan and pictures of Kabul on my mom's iPad that really helped me to understand. Finally, I thought that the story line would have had to be way different if it were in Pakistan or China; the neighboring countries. I liked the plot because it really showed how life was like in Afghanistan and how they had to fetch food and water when they were so little. Nothing in the book felt fake like some books do. I was always interested in the story line because there was always something new happening on each page. I couldn't guess what was going to happen next. In general, my favorite parts of the book were when Mrs. Weera kicked people into shape and was a big part of the action. It was really smart to have a character like her in the book. The other parts of the book that I liked were the parts where they talked about what the Taliban did and how it affected people's lives. That was really interesting and I learned that people have special ways to get through hardships. Throughout the story I felt anxious and happy at the same time because I knew that something would turn out okay because the people are persistent and are joyful with what they do. However, once one thing turned okay, another thing went wrong! I never knew what to expect from the next page. I think that the writing of this book was a bit too easy for me, however, there were some complex words and some Afghan words that were hard to understand at first. Even though the story had every event close to each other, it didn't feel choppy because they were described so well. In the back of the book there is a very good glossary that had Pashtu words with good definitions so that I could understand it. Finally, in the front of the book, there was a map that showed Afghanistan and all of it's neighboring countries. That made it easier to analyze all of the places the book talked about! Over all, i really liked this book! Helen, you are definitely going to have to start a spin-off review blog for Sophie or ask her to review here more often! She's done a fantastic job reviewing in depth! And Sophie, great job! I loved your review and how well you described the characters and their behaviors! Hope to read more of your reviews!